Green juice made from green vegetables will be more delicious to drink when the weather is cold like now. 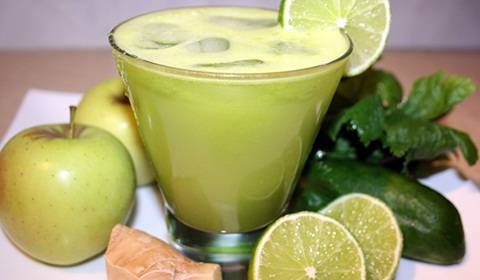 This time mixed juice recipe creation uses a combination of vegetables and apples, and the addition of ginger to give a warm effect to the body. This effect is obtained because ginger has the effect of improving blood circulation so that the body feels warmer even though the weather conditions are cold due to the rainy season. Green apples are rich in pectin compounds where the benefits can nourish the digestive system, improve intestinal function, reduce cholesterol, and break down body toxins. That's why this one green fruit is very suitable as a juice maker for a healthy diet. In addition, apples serve as the main ingredient and sweetener of juice so you don't need to add honey or sugar. Some time ago we distributed 5 green vegetable juice recipes along with a discussion of the benefits of each processed juice. For this time, the juice ingredients used are green apple, celery, cucumber, lemon or lemon, and ginger rhizome. The combination of all fruit and vegetable ingredients will produce tremendous benefits for health, of course, besides the effects of natural warmth thanks to the presence of ginger. Cut apples and cucumbers, peel lemon peel (or lime). Put all ingredients into a juice extractor or juicer. You can use a blender to make juice with notes of lemon juice squeezed in the water before putting it in a blender. It may taste a little different than using a juice extractor or juicer.